Suhani Pittie, a ‘jewellery artist’, has been called “1 of the 10 women to look out for in India in 2007,” by Elle Magazine, and also been named as one of the “30 rising stars of the country”! A columnist on accessories and fashion for ‘The Telegraph’, India, she happens to be the first Indian jewellery designer to have participated in the Miami Fashion Week ’07. “Marshes & Marigold”, Suhani’s collection for the WLIFW SS’08 is an impersonation of art upon jewellery. The styling is fashionable, feminine, art nouveau, textured and each piece is exquisitely hand painted. The jewellery, which Suhani refers to as “jewel art” is available in stores across India and abroad, including the prestigious Museum of Arts & Design, New York. We know you started young, were there any major challenges in the beginning? Being a young woman in her twenties, was it ever a struggle to be taken seriously? Did it help that you had ‘Anamika Khanna’ for a sister? There are challenges every single day-because in this field you have to be ‘one up’ in creativity to do something more smashing every time and this is an every morning ritual. To break free from what you have done, to come undone and do something extraordinary all over again, it takes a while for one to be able to cope with ones own pressure. Every business has start up issues. When I started three years ago, the biggest challenge I had to overcome was to find the right karigars who had an open mind and were ready to listen to what I was saying. This was no easy task as all over our country karigars are used to doing the traditional gold, the oxidized silver or the wax casts. I fit in none of the above. So it was a lot of trial and error. But now I am very happy with my team! It has never happened that I have not been taken seriously. I am still in my twenties, with my brand present in 18 fashion houses including an art museum in New York. I think in business sometimes the product might be bigger than the creator. I am happy that it is… in my case as well. So people know the ‘Suhani Pittie brand of jewellery’ but may not necessarily know ‘Suhani Pittie’. I am ok with that! Being Anamika’s sister has helped in one way.. I am slightly more fashionable! What usually influences your design vision? Places? People? What or who would your muse be? A monogrammed silver biscuit; the sheer sight of red hot metal and its undulating molten state. Nothing can set you heart racing so fast! Metal is my inspiration. I think the other biggest influence in my life is art. I am an artist and I would like to be known as one. Not just a designer, but, someone who could collate to a full vocabulary of design and create the most beautiful art pieces ever. My design vision is beyond boundaries hence there are no people or places influencing it. My muse would be every woman who has the courage to not follow but lead because such strength would relate to the strength in my work. How do you stay inspired and motivated? What is your design process in general? My motivation comes from a simple fact. A buyer today has the option to choose between wonderful things. So that really leaves me with little choice but to stay motivated and push myself to a higher level of creativity. Design process-I always source my raw materials first. In most cases the cut, shape or inclusion of the stone decides the design around it. I have never designed a piece and then go looking for the stones for it. Do you have any favorite jewelry pieces you’ve created and why? 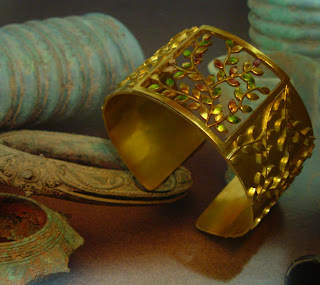 The first cuff- it was beaten texture with mother of pearl. It’s my favourite because I think I was able to introduce it correctly to the market and hence connected this ornament to the general buyer. Maybe I dislodged it from the image of “only for the avant-garde wearer with the oh so perfect wrists!” I suddenly see a lot of cuffs happening around me and I feel I have contributed to that! Do you think there’s a particular kind of woman who is drawn to your jewelry? Certainly. Someone who has a mind of her own and is not a victim of changing trends! Where do you see jewelry trends going over the next few years? Jewellery has been an integral part of our lives. It does have a relative fashionable meaning but I think it’s much bigger than fashion itself. So to typecast it under trends would be unfair. However there is an overall inclination towards sophistication, feminity, unconfused form- be it in any attribute of fashion-not just jewellery. But I can safely say that brooches and cuffs are going to work wonders all over again. The next few years would see jewellery becoming the deciding factor in a woman’s wardrobe and not just an accessory! Do you have a particular take on what kind of jewelry and how much a woman should wear, or how she should select pieces for her collection? Its very important that a woman understands her own fashion style before she tries on what’s floating in the market. However the key word is ‘try’. But one should not try to grab attention by looking like a chandelier and dressing over the top. The idea is to gracefully demand the attention, which comes with ones own personality. So one should never wear too much of jewellery at a time. Highlight one body part by wearing one elaborate piece and see the magic it creates. To select pieces for your collection, just buy whatever your heart goes out to. Does not matter if your neighbor does not think too much of it. Remember jewellery is beyond fashion. So what you buy today maybe vintage tomorrow. It will be gorgeous even then. But wear your age and your personality. Don’t try to be someone else. What other projects are you working on this spring? Anything new on the horizon for you? Ever since the Museum of Arts and Design, New York commissioned my work and the big project with veteran artist Mr. Vaikuntum happened where I made jewellery with his miniatures, I have become a little more inclined towards the art element in my work. Hence I am currently working on more elaborate pieces that are absolute one offs. New things emerge every day. Right now I am obsessed with wood and buttons! Finally, is jewelry to you, like fashion, seasonal, or like style, timeless? Brilliantly asked. Jewellery I think is immortal. Designs and designers would come and go but like life, jewellery would go on. There might be shifts from art deco to art noveau or vice versa but jewellery, stones and their beauty would always be an inherent part of who were are. 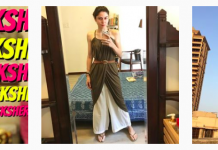 For a complete list on where you can buy Suhani Pittie’s designs and for more on the artist/designer, go HERE!